Unfortunately, not my best work behind the glass. The Beast has a way of hiding foreground obstructions on the fringes of the focus point. This happens a lot when shooting through dense shrubbery or branches, which was exactly the case here. I would have taken a bit more care had I known at the time this would give a boost to my count. Stepping back a bit, we were visiting one our favorite national wildlife refuges along the Texas Gulf Coast, Laguna Atascosa NWR. As if that refuge hadn’t already produced an astounding number of +1’s, it managed to stealth add another one. What you are looking at is a Thrasher. If you are from the Midwest you are probably thinking “eh, can walk to any park with trees and have a good chance of getting one of those in the tin”. Sure, and even easier for me since I can spot them in my backyard during the Summer breeding months. 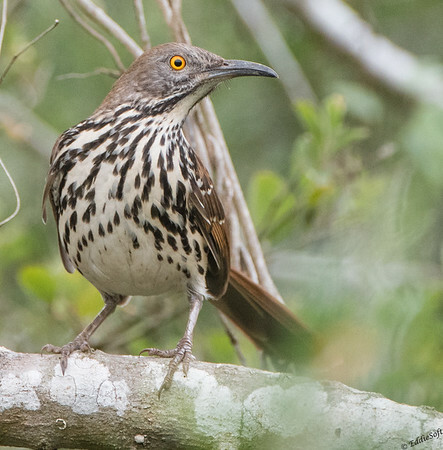 Except there is one mistake with that assessment and the exact same mistake I made in the field – we have Brown Thrashers here in the Midwest (link here) and just about the entirety of the eastern half of the US. This specimen flew up into a nearby tree while The Beast was busy gathering shots of a Golden-Fronted Woodpecker (link here). It caught the eye, so took a gander, saw the long curved bill paired with streaky breast and that tell-tale yellow eyes, classified it as the Brown which was already checked on list, executed golden rule of never passing up a bird and then went back to shooting the Golden which was not on my list. It wasn’t unit looking at the spoils later that trip when something looked odd. It had those key features, but the body was greyer and the bill was beefier. A quick validation with the reference books confirmed that it was a different species. This was followed by immediate regret that more time was not spent on it to get better pictures for me and my readers. Chalk one up for the golden rule once again – at least there was a shot in the tin. Two to be exact, but they both suffered from the same poor execution. 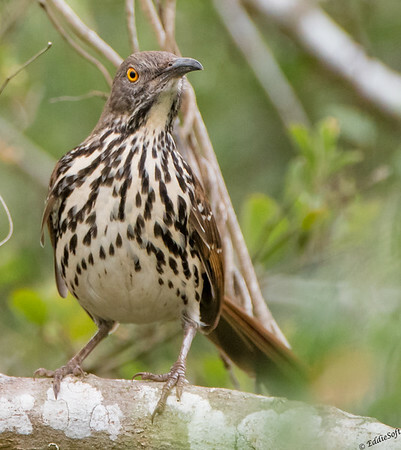 So, for some help in the field for future sightings, the Long-Billed Thrasher has heavier breast streaking, grey toned (vs the brown tones of the … well the Brown variety), the thicker bill as mentioned and a thicker tail although that might be hard to tell in the field. What you can tell in the field is the Long-Billed has streaked undertail coverts – you can just barely tell that in the two shots I have. Oh, this might help you out to – the Long-Billed hangs out ONLY in the Southern tip of Texas and along the coast into Central America. Sorry Ron, you are going to have to travel to fill this gap hehehe. Was hoping to give you some interesting cool facts about this new addition, but Cornell is pretty weak on this species. They basically just state that the Long-Billed really doesn’t have that long of bill compared to the other Thrashers (Le Conte’s and the California or the other Texan occupier the Crissal (all streakless so no worries about getting them confused). All I have for you folks – hope you enjoyed this new bird on my list now. I need to go up my count and update my presentation – kind of embarrassed by my relatively low birding count, but I have a self-imposed rule that it doesn’t get counted until I have definitive proof in a picture and it has been featured here. No “hear it” for the count allowed here. Looks like an angry thrush that’s flown into a wall! lol. The shots are great, lovely and crisp in the head and eye, you should stop beating yourself up, that little bit of blurred foliage adds to the feel. Yeah I know we all like the ‘perfect’ shot sometimes it doesn’t happen, birds are birds. Appreciate that Brian! problem is I’m surrounded by better photographers (case in point!). I find the Thrasher family in general have angry disposition – never considered it being from the inability to avoid walls – may have to use that in my upcoming speech ha. Thanks for the laugh and for stopping by. Hmm, I was going to go back and see if I had one of these but mistook it for a Brown Thrasher, until I read where they hang out. Oh, well, another target bird for when I get to Texas! Ummm, one second, let me check the Texas birding websites. ohhhhh, bad news, much like that crow at the Brownsville dump, the Long-Billed has left the area and now spending its time enjoying the sun and fun in South America. Quite a shame, sorry about that.